I am not very good at this blogging, I forget to update it for weeks at a time. Over the last few weeks I have taught 2 screenprinting classes. One was for the public and one for digital design students who had the designs all ready to go and just needed to get them onto a t-shirt. One was very low-tech, the kind of process I use at home where I don't have access to all the fancy equipment. One was high-tech in that we used the vacuum table and special exposure unit. Both classes were great fun but I was shattered at the end! I didn't even take any photos. Over the 8 days I managed to coat about 20 screens with the photo emulsion and help students coat about 20 more, and help about 15 students with their designs which required at least 3 colours per print. Pretty full on. 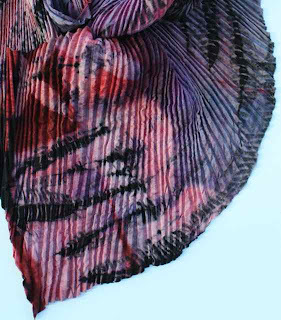 I have also been making scarves for a shibori exhibition at Barometer Gallery ,13 Gurner St., Paddington, NSW. The exhibition will be opened by Yoshiko Wada who wrote the bible for shibori artists 'Shibori: The art of Shaped resist"
Barometer Gallery will open on Thursday, Friday, Saturday and Sunday each week from the 8th September to the 3rd October, 10am to 6pm. Here is a detail of one of my scarves that will be on the sale table. We each have one major piece and up to 5 for sale. This is the first time I have entered a shibori exhibition. It feels funny not entering a quilt which needs a hanging sleeve etc. I don't even know how they display them. This scarf is made of 100% merino wool jersey and has been clamped and bound and dyed about 6 times in acid dyes. Dyeing wool is also something new for me and I have been experimenting with both acid and fibreactive wool dyes. They react differently to Procion dyes on cotton and I am just learning how they work.